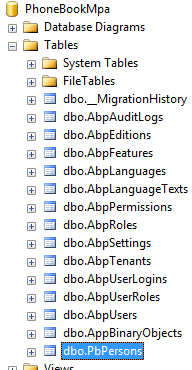 We use Entity Framework Code-First migrations to migrate database schema. Since we added Person entity, our DbContext model is changed. 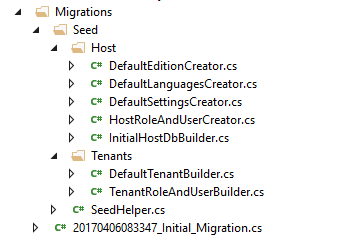 So, we should create a new migration to create the new table in the database. We don't have to know so much about format and rules of this file. But, it's suggested to have a basic understanding of migrations. In the same Package Manager Console, we write Update-Database command in order to apply the new migration to database. After updating, we can see that PbPersons table is added to database. These type of default data is good since we can also use these data in unit tests. Surely, we should be careful about seed data since this code will always be executed in each PostInitialize of your PhoneBookEntityFrameworkCoreModule. This class (InitialPeopleCreator) is created and called in InitialHostDbBuilder class. This is not so important, just for a good code organization (see source codes).